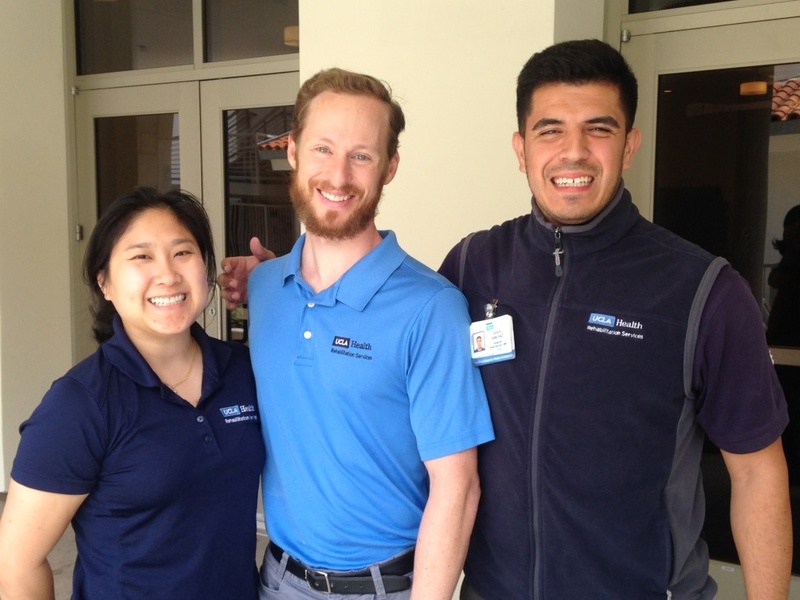 In 2013, UCLA Rehabilitation Services was seeking opportunities to connect with their community and offer wellness services. The SAIL Program provided the perfect venue to serve the older adult community. Six therapists from UCLA Rehabilitation Services completed the SAIL Program Leader training online through Pierce College. 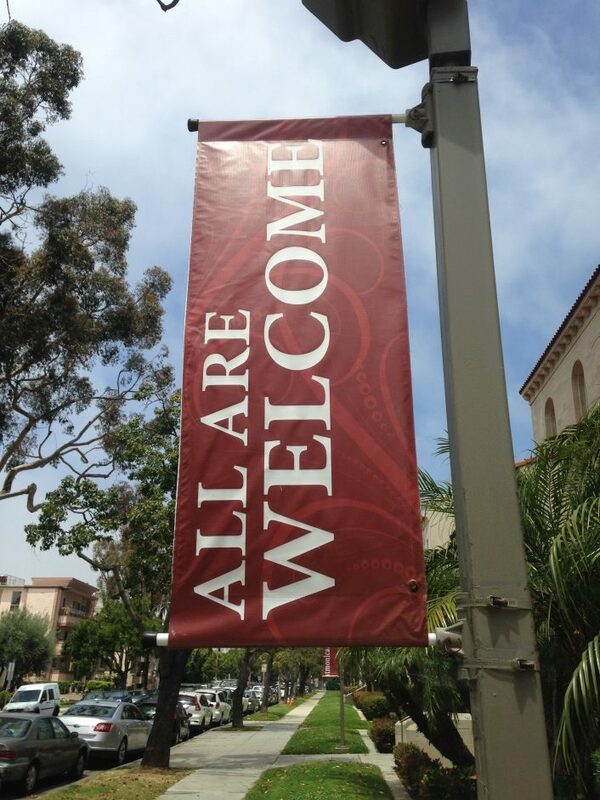 The SAIL Program started at UCLA Outpatient Rehabilitation Services in Santa Monica, and eventually relocated to St. Monica Catholic Community, where it continues today. Therapists who work at UCLA Rehabilitation Services and have completed the online SAIL Program Leader training have the opportunity to rotate through a one-month period of leading the fitness class. “I think it is a great class”, Clara told us. “I look forward to the class every time we meet. I can do the exercises, but they are challenging, especially the cardio part of the class”. 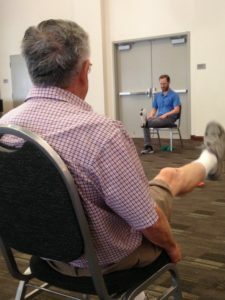 Matthew Konersman, PT was one of the therapists leading the SAIL fitness class when we visited in May 2017. Matt shared his appreciation for the adaptability of the SAIL fitness class. “The SAIL fitness class can be tailored to each level of age and disability”, Matt said. “It’s tailored to challenge people to the next level”. The SAIL participants are also appreciative of the adaptability. Shirley told us that the most memorable tip she has learned from the SAIL Program Leaders is to “go at your own pace. The instructors stress this. It makes exercise fun and doable”. 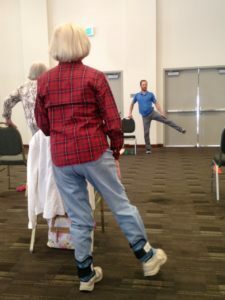 We noted that Matt provided frequent verbal and visual cues throughout the fitness class, and the SAIL participants also took note. Lynda stated, “I’m eternally grateful for the fitness leaders. Each one provides a variation on the exercises – tips that we can carry through with all classes. SAIL has taught me how to exercise. After a knee replacement and back surgery I was in poor shape. The doctor recommended I join the group and it has changed my sense of well-being and improved my health and inspired me to exercise outside of class”. Matt acknowledged Lynda’s thoughts when he shared his satisfaction with the education portion of the SAIL fitness class. “You can see that their technique in performing the exercises improves over time”, he told us. 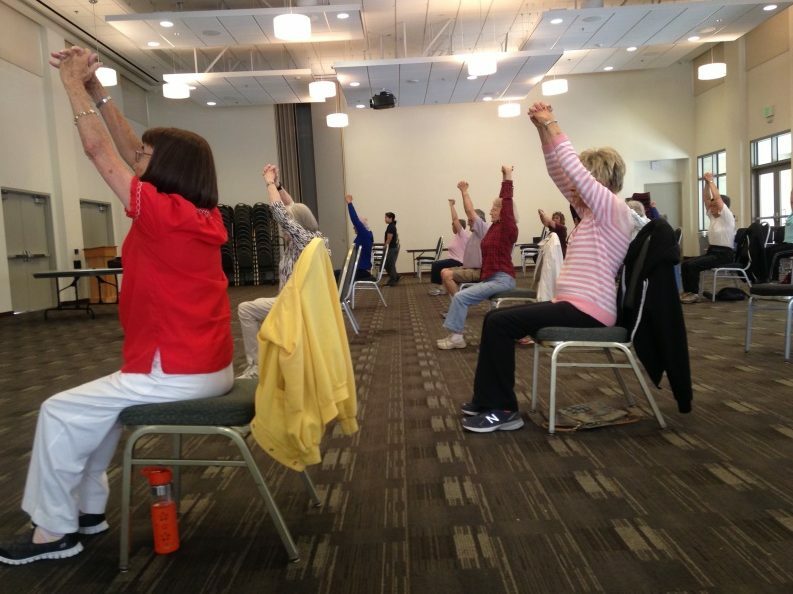 SAIL is an evidence-based exercise program that increases strength, balance, and fitness in adults 65 and “+”. Bertha is one of those “+” people, although you’d never guess it if you met her in person. “I’ve always been active but after retiring from teaching dance at age 92, I didn’t want to just sit around and be inactive. SAIL was just enough exercise for my “90’s”. Thank you Nancy, Matt, and Jesus, for allowing us to shine a spotlight on your SAIL story!